The law presumes you are in charge of your financial and health care decisions so long as you have capacity. You do not lose or give away your rights by executing a power of attorney or a health care advance directive. In fact, you are more likely to get what you want if you execute those documents. The reason is because you have the ability to select the individuals who will be your surrogate decision-makers if you lose capacity. So, what is capacity? It is the ability to make or communicate significant decisions about your person (e.g., health or housing), and about your finances. Capacity is a continuum. You might be able to do everything. You might be able to do somethings (e.g., vote), but not others (e.g., operate a business). You might not be able to do anything. The key is supporting your values by creating a decision-making structure that helps you regardless of where you are on the continuum. Let’s begin with health care decisions. Until you lose your ability to make or communicate decisions about your health, you remain in charge. Even if you execute an advance directive, your health agent cannot overrule you. You are the captain of your own ship. If you reach a point when you cannot make or communicate decisions, the person you designated as your agent takes over. When that happens, the law requires your agent to act in a manner that is consistent with your known wishes. Let’s think about what that means. If you expressed yourself and put your wishes in writing, then your agent knows what you want and is legally bound to follow your instructions. But if you haven’t made your wishes known, then who’s values guide the decision-making process? Not yours because you didn’t tell us what you want. So, rather than losing your rights, by executing an advance directive you actually enhance your rights. Let’s approach this again from a different perspective. Some people refuse to execute an advance directive for health care because they view it as a “license to kill.” That perspective is based on myth, rumor and ignorance. Most advance directives do not address situations where you would recover because health care professionals will always provide the necessary care to help you get better. Instead, they address situations where care is futile, you are at the end of life and you will die soon. An advance directive does not empower your agent to accelerate the dying process. No one has power to help you into the grave before your time. But if you still want to squeeze out as many extra days as possible, you can instruct your agent to place you on life support and request heroic measures to keep you alive as long as possible. On the other hand, if you instruct your agent to allow the natural dying process to take its course, then your agent would do as you instruct. Or if your values are some other course, then your agent should do as you instruct. So, an advance directive for health care is a statement of what you want, not a license to follow someone else’s values. Now let’s talk about finances. If you appoint someone as your agent under a power of attorney, that person is your servant. If they agree to serve, then he or she has a fiduciary duty to help and support you. Your agent cannot enrich himself or herself at your expense without becoming liable for theft, mismanagement or self-dealing. There are civil and criminal penalties for abusing a fiduciary relationship. Does that mean people won’t take advantage of you? No, but it does mean the law does not look favorably on someone who thinks about your property as their own personal piggy bank. Some people refuse to plan for the future because they fear abuse. However, refusing to plan for the future is also risky. The time for thinking about who will help you is something you should do before a stroke or other major event that deprives you of capacity. Select an agent who shares your values before its too late. If you fail to plan, then we might be forced to seek a court appointed guardian or conservator to make decisions after a major life event steals your capacity. The guardianship and conservatorship process is expensive and might not be consistent with your family values. 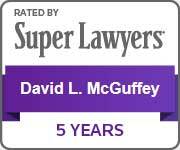 David L. McGuffey has helped hundreds of families put decision-making structures in place. If you want to protect your future, call us today and let us help you find peace of mind.